First impressions: The Tangent EVO E5 comes in a very fetching high-gloss white (high-gloss black and real wood veneer options are also available), looks absolutely dapper, and would be a nice match for any like-coloured iDevices you may have lying around. Tangent is a Danish company, although it does not say where its manufacturing process takes place. Just know that it has managed to keep the prices of its products ridiculously low. 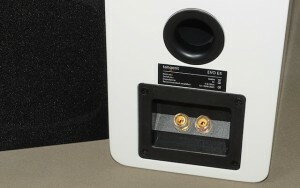 The E5 appears to be an ideal match for Tangent’s own EXEO Amp and EXEO CD player – equipment hich I had sampled before but was not on hand to listen to as a complete system, unfortunately. Specs: This compact two-way bookshelf speaker sports a five-inch fibreglass cone woofer and one-inch silk dome tweeter. Stated frequency response is 55Hz to 20kHz, with an impedance of 4 Ohms and sensitivity of 86dB. 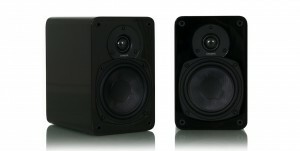 The cabinet measures 22.8 x 14.5 x 20cm (h/w/d) and weighs in at 3.5kg per speaker. The boxed package also includes plastic wall brackets and handling gloves. 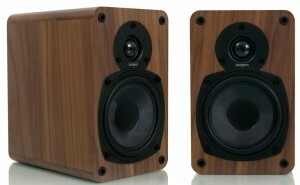 Performance: I’ve always had an affinity with small bookshelf-type speakers. Yes, they are for most part bass-shy, but the size brings other benefits. For starters, they don’t take much effort to move around, which is particularly welcome when trying to get the correct placement for them. Secondly, they usually give precise imaging and throw a nice, wide sound stage – more often than not, this goes beyond the physical speaker boundaries, seemingly emanating from everywhere else but the speaker itself. And that was generally the case with the E5. However, I did find the speakers needed a little bit of rear-wall reinforcement to coax a bit more bass out of the meagre cabinets. Bearing size in mind, one should not expect rafter-rattling bass, but what was available could still provide some punch to drums and bass lines alike. However, I had some issue with the E5’s ability to bring out detail – which is somewhat related to treble performance. They did not exactly sound dull, but there was a lack of sparkle in the upper registers. Midrange was well rendered, I must say. Vocals had good presence and were easily picked out from the mix of accompanying instruments. I did discover how loud they could go during one ill-timed listening session (I think it was about 1.30am). The other half – who rarely bothers me when I’m in the listening room – popped open the door and asked for the music to be turned down. And this with Mark Knopfler (one of her favourite artistes) going on about microwave ovens and such! She did a quick double take when she realised that it was this diminutive pair of speakers that was producing that volume. While the speakers did go loud, you could hear that they were struggling to keep pace with the music. After a point, the sound muddied up too much, and I just wanted to turn down the volume. The good: Judging by fit and finish alone, the Tangent EVO E5 is a winner. Its sleek curved cabinet and glossy finish would find favour with almost anyone. And at its asking price, you can hardly fault its sonic performance – it might round off the top frequencies, but is an all-around easy, non-fatiguing listen. The ungood: Limited frequency reach at the top and bottom, and lack of fine detail do not bode well for critical listening. Final verdict: This isn’t a speaker that will thrill seasoned (jaded?) audiophiles, but is an excellent choice for the casual listener. Its toned down treble performance may also be a good thing when paired with lower-priced, overly-exuberant electronics. Those seeking an affordable speaker for everyday use that will fit into contemporary living rooms should take a look at this pair. Sources: Dell Latitude D630 notebook, M2Tech Young DAC/Palmer power supply; Rega P5 turntable with Audio Image phono stage / Amplification: Euphonic Research ATT600/Amp-220 pre-power combo / Cabling: Rega SC42 speaker cables and an assortment of custom-made pure silver interconnects. Dynaudio Xeo – THE high-end wireless speaker?